But just how 'lite' will it go? 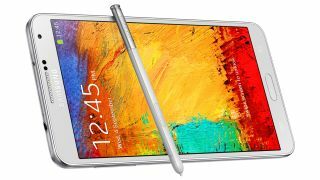 The Samsung Galaxy Note 3 Lite, believed to be arriving in a matter of weeks, looks set to downgrade from a full HD to a 720p display. "Hey, it's called the Lite for a reason, what did you expect?" we hear you cry. Well no, we're not exactly surprised by the information, which was spotted in a user agent profile for what is allegedly the non-LTE version of the phone. The phone will still remain at the 5.7-inch size but the same profile says it won't be upgraded to Android 4.4 KitKat – still 4.3 for now. That may change when the phone actually launches, however. The screen will also be switched from AMOLED to LCD, according to other reports, and will be bringing its 13MP camera down to an 8MP affair. Let's hope it also gets a really tempting price tag to make the reductions worth it. If it does, Apple should probably hurry up and get a bigger iPhone out the door. CES 2014 is just around the corner, but all rumours so far suggest the Note 3 Lite is holding off an appearance until MWC. But what do we think of the Samsung Galaxy Note 3 as it is?